Record of strong advocacy in the Courtroom. Wide knowledge and understanding of the Law. Leadership role in Bar associations and the promotion of the Judiciary and Legal profession. Provision of legal services to disadvantaged persons. Admitted to practice in the British Virgin Islands. 1984. Admitted to practice in Jamaica. 1974. Admitted to practice in St. Kitts, Nevis and Anguilla. Degree of the Utter Bar by the Honourable Society of the Middle Temple UK. 1963.
formerly of Chambers, Fort St., Basseterre & Main Street, Charlestown. Provides general legal services, which initially focused on Criminal and Civil matters then expanded in the fields of Corporate and Constitutional Law. Operates at the Magistrates’ Courts, the High Court and the Court of Appeal. Represents both defendants and claimants. Recognized as having lobbied publicly and eventually successfully for the appointment of a Resident Judge for the Island of Nevis, and, for the Court of Appeal to sit in Nevis on island matters. Competent in Corporate Law, for example established the legal and financial structure of the well-known Four Seasons Resort (Nevis) group of companies. 1986-1995. Provides opinions and representation in connection with disputes involving both local and foreign corporations registered under the local Offshore Legal regime. Provides pro bono services and advice to low-income women in matters dealing with maintenance. Assists low-income tenants in claims under the Small Tenements Act. Legal Adviser, Nevis Island Administration, Charlestown, Nevis. 2001-2006. Provided legal advice to cabinet. Represented the administration in litigation. Drafted legislation, ordinances and regulations, for example:- The Nevis Physical Planning and Development Control Ordinance, 2005; The Nevis Coastal Protection Levy Ordinance, 2002; The Nevis International Insurance Ordinance, 2004; The Nevis International Mutual Funds Ordinance 2004; and, The Nevis Island Government Loan (Guarantee) Ordinance, 2002. Legal Adviser, Matalon Group of Companies, Harbour Street, Kingston, Jamaica. 1974-1977. Counselled on legal matters regarding the companies’ structures and operations with specific reference to land, construction and housing development. Advising the Ministry on land transactions and processing land transfers and other proprietary interest for registration. Deputy Commissioner, Commission for Eastern Caribbean States, 10 Haymarket, London SW1. 1968 – 1972. Responsible for legal, welfare & student affairs of East Caribbean people, and dealing with other consular disputes and matters. High rate of success in the Assizes in St. Kitts, Nevis & Anguilla in prosecuting murders and other serious offenses. Representing the defendants were able and experienced counsels, for example, Maurice Davis Q.C. 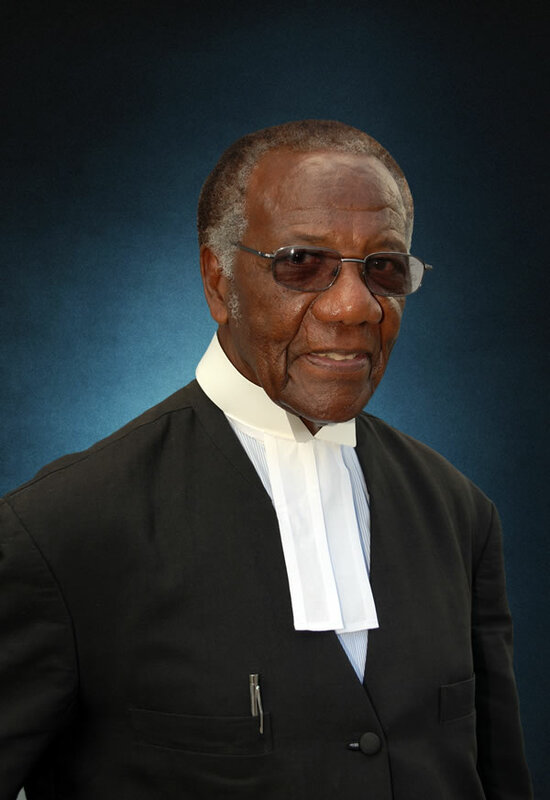 subsequently Chief Justice of the OECS, Frederick Kelsick later Queen’s Counsel, Dr. William Herbert and Franklyn Adams. Represented the government in civil matters in the High Court and the Court of Appeal including assistance in the research and preparation of the Appeal in the first major case in St. Kitts of government land acquisition under its Land Acquisition Ordinance 31/1958 in Wigley and others vs. Bellott (Crown Land acquisition)), reported at 9 W.I.R. (1965). Principal, Theodore Hobson, Chambers, Main Street Charlestown, Nevis. 1963- 64, 1966-1968. Pupil, Chambers, 3 King’s Bench Walk, Temple, London EC1. May – October 1963. Pupillage in Civil and Criminal matters, and opinion drafting with Ian Payne. Barrister-at-Law. Electoral Reform Consultative Committee (ERCC) of St. Kitts and Nevis. (2007). Public Service Appeals Tribunal of St. Kitts & Nevis. 1992-1998. Cable and Wireless St. Kitts & Nevis. Director. 1992 -2007. Nevis Housing and Land Development Corporation, Deputy Chairman. 1992-2006. Council of Legal Education (Caribbean). Member. 1990 -98. Member of the Selection Committee. 1994- 98. Kitts, Nevis & Anguilla National Bank Ltd. Director. 1995-1996. Social Security Appeals Tribunal of St. Kitts & Nevis. Appointed Chairman. 1978- 1979. Vice President. 2009 – present. Member . 1993 – present. Represented SKN Bar Association as President in the early years of establishment of OECS association and recently as Vice President in both St. Kitts and Antigua. Married since 1972 with two sons and a daughter.